Settings for WooCommerce Bookings are all found under Bookings > Settings as of version 1.13. Previous to version 1.13x, some settings were located at WooCommerce > Settings. Go to: Bookings > Settings > Global Availability. A hair salon offers one-hour appointments for haircuts and is open Monday – Friday, 9:00 a.m. – 6:00 p.m. with the last appointment at 5:00 p.m. The owner has decided to close the salon for a holiday break between December 22, 2014 and January 4, 2015. 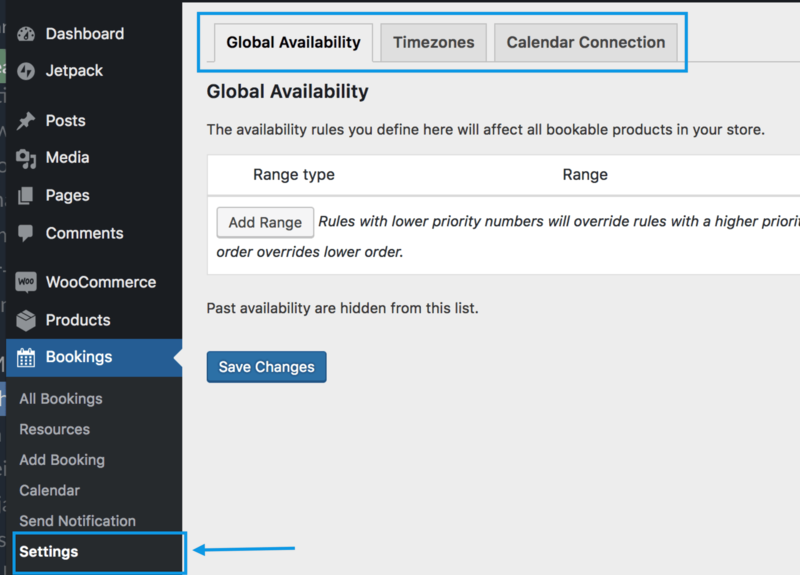 By default, Global availability rules take priority over product level availability rules and product availability rules take priority over resource priority rules. Note that every possible time block, as defined within each bookable product, must be designated as either bookable or not. 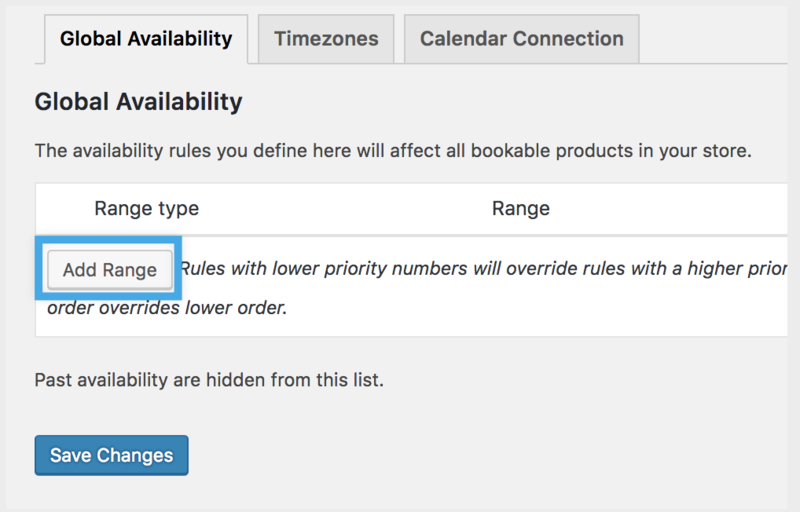 For more information on setting up availability rules, see: Creating a Bookable Product. For more examples, go to the other Use Cases. Go to: WooCommerce > Settings > Timezones. 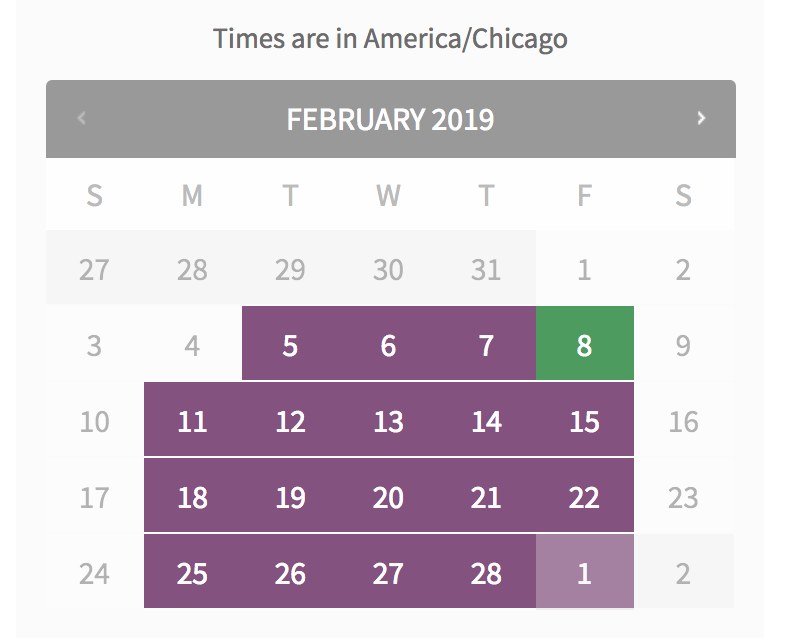 Tick the box for Enable Bookings Timezone Calculation, if you want Bookings emails and other automatic events to be triggered using the site’s configured timezone. If disabled, events are triggered on UTC time. Timezone – Use your visitors’ local time or yours. This only affects bookable products with the booking duration configured to either minutes or hours. 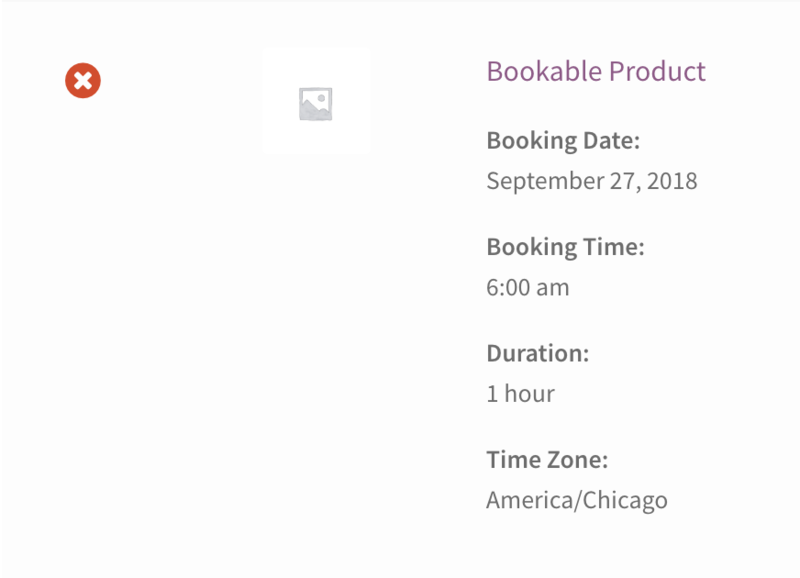 Bookable products with the booking duration set to days or months are always displayed in the site’s configured timezone. Calendar start day – Use the visitors’ locale or yours. If yours, info is pulled from: Dashboard > Settings > General > Week Starts On. Some countries start the week on Sunday; some on Monday. 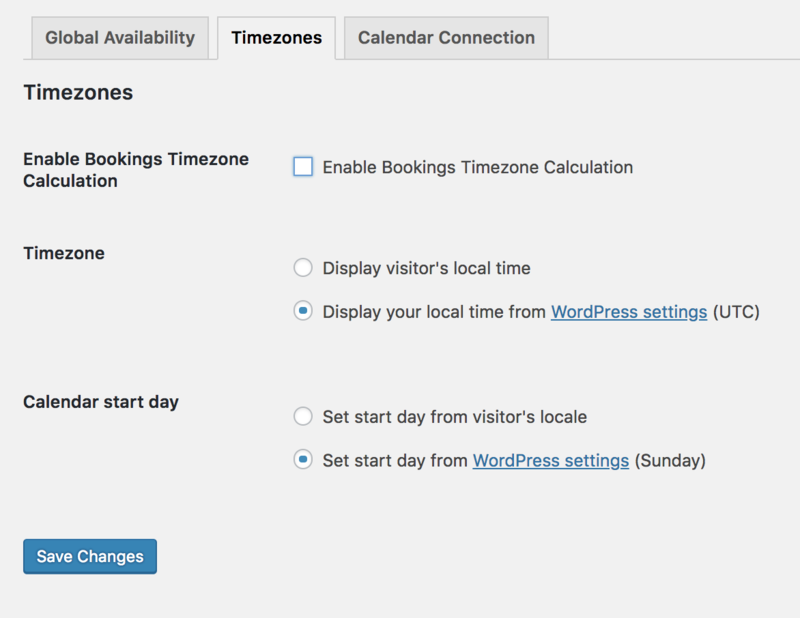 The frontend Bookings calendar displays in the timezone specified: Visitor or yours. 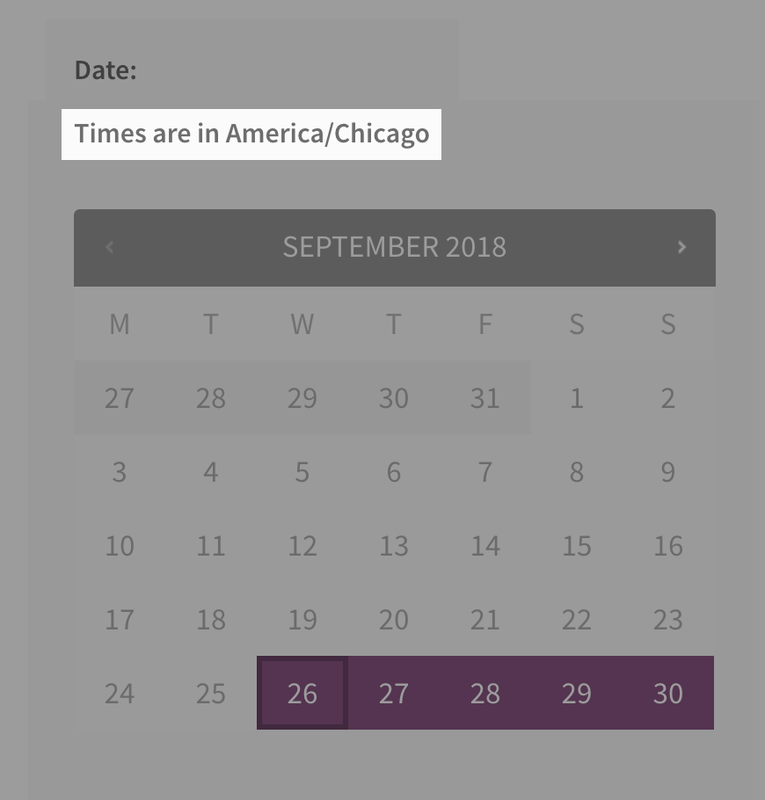 After the booking is made, the time displayed to the customer is in their timezone, including the cart, order confirmation, and reminder emails. The frontend Bookings calendar displays according to the Start Day specified: Visitor or yours. 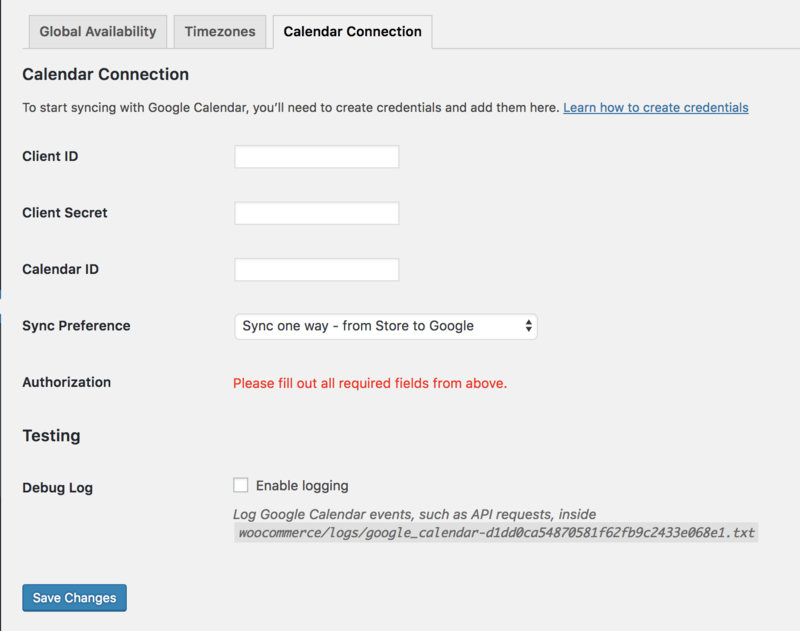 WooCommerce Bookings enables a two-way sync with Google Calendar. You will need a Google account to use this functionality. Obtain from Google your Client ID, Client Secret and Calendar ID by following instructions at: Google Calendar Integration. Authorization and verification begin when all credentials are entered. Check your credentials if this does not complete. Enable logging for Debug Log for troubleshooting purposes. Otherwise, it should be disabled.